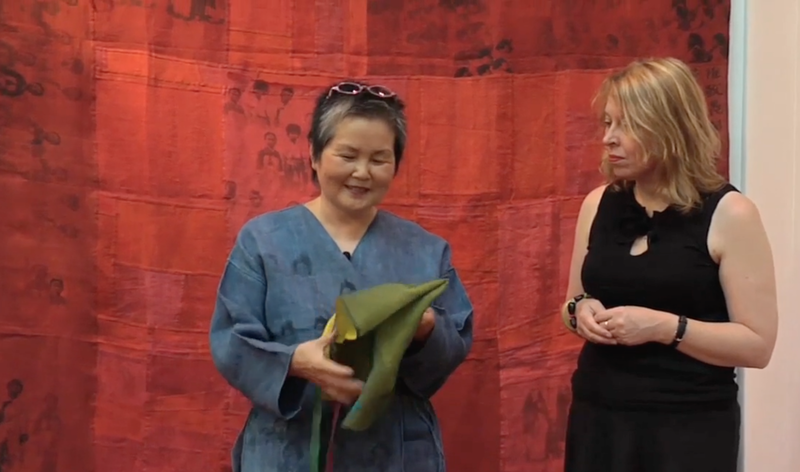 Chunghie Lee discusses pojagi patchwork textiles with Liz Cooper. Pojagi ('Po-Jah-ki') Korean traditional wrapping cloths were originally made by nameless women throughout the Choson dynasty. (1392-1910). In olden times, these women's world was in their home, but today their world and work has reached beyond their modest houses and communities into leading design schools and art festivals, as we find with the work of celebrated Korean Pojagi Artist, Chunghie Lee. Not satisfied with traditional folding cloth methods alone, Chunghie Lee embraced the classical art form of Pojagi, and further expanded on it with a line of wearable art clothing, wall hangings, and multi-dimensional textiles, often incorporating old photographic images of simple peasant women peering out at us alone and in groups, as Lee puts it, "in order to recognize and pay homage to the contribution they made to this traditional art form over the centuries". "Pojagi and Beyond", as Lee refers to her course at the Rhode Island School of Design and in traveling exhibitions from Hawaii to the Victoria and Albert Museum in London, is one Korean woman's passion for creative fibre arts and her desire to teach others so that they may find in Pojagi the freedom and expression she finds from this ancient Korean art form. Liz Cooper caught up with Chunghie Lee and interviewed her at the 2009 Festival of Quilts in Birmingham, England.